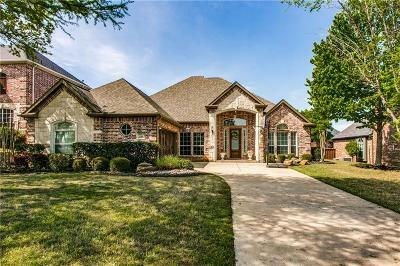 Gorgeous remodeled single story home backs to GREENBELT and trail system in beautiful Castlewood subdivision, home has excellent drive-up appeal with a beautiful brick and stone elevation and mature trees! 4 bd, 2.5 ba, formal dining, study with French doors and wood floors, 2018 Upgrades include Fully Remodeled Master Bath with walk in shower vanity with dbl sinks, secondary bath remodeled also, NEW designer paint, NEW hot water heater, NEW disposal, New ovens and more! Vaulted ceilings with extensive crown molding throughout, plantation shutters, Gourmet kitchen boasts granite countertops, an abundance of cabinetry, gas cooktop, and SS apppliances. Large covered patio in backyard is terrific for entertaining!